At 27, Simon Harris is now our most senior junior minister. Makes you wonder what you’ve been doing with your life, doesn’t it? 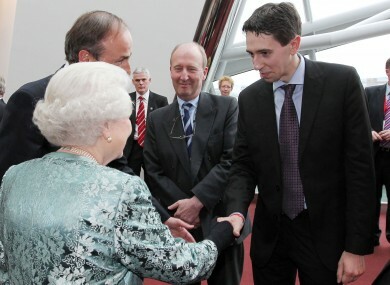 Simon Harris and the Queen, during her 2011 State visit. SIMON HARRIS’S ELEVATION from the backbenches was the big the surprise in this afternoon’s announcement of the new line-up of junior ministers. There’d been speculation that the Wicklow TD might be in line for a promotion in the run-up to today’s reshuffle — but the fact that he’s been given such a big job is being seen a major coup for the Fine Gael politician. Harris is moving into the office vacated by Brian Hayes following his election to Europe — taking over what’s perhaps the country’s most important junior ministry, spanning both Michael Noonan and Brendan Howlin’s departments. Not that anyone’s raising any particular questions about his ability — commentators have noted Harris’s strong performance in the high-profile Public Accounts Committee over the past year. And in their statement welcoming his appointment to the finance job this afternoon, Noonan and Howlin give him their official seal of approval, saying they believe he’s up for the challenge of a “new, challenging and interesting” portfolio. What’s been really catching people’s attention this afternoon, however, is the new junior minister’s relative youth. So pleased for Simon Harris. A hard-working young man who deserves his success. Simon Harris is likely to get the Department of Finance junior Ministry, be interesting to see how many young Labour TDs get a chance. As the youngest member of the Dáil, Harris was given the honour of nominating the Taoiseach in March of 2011. And he’s also occasionally been called upon to exploit his youth to the advantage of the party: like the time he appeared beside a Beatles tribute act during the Seanad abolition campaign to point out that the last time the upper chamber had rejected a bill was 22 years before his birth (you had to be there). So, for no reason in particular — other than to make a significant number of our readership wonder what they’ve been doing with their lives — here’s what was happening in the world, the year that Simon Harris arrived into it. And here at home, we lost Philo. *Update: Reader Eoin Wilson has just pointed out in the comments section that a certain former Europe minister was born in 1980 – which, obviously, almost entirely negates the premise of this post. Anyone who stuck with it to this point will just have to accept our apologies. If you happen to be called Lucinda, we’ll make that an extra sincere apology. Email “So just how young is the country's youngest junior minister?... The Edge has hats that are older”. Feedback on “So just how young is the country's youngest junior minister?... The Edge has hats that are older”.